Before we ever even talked about buying an RV and hitting the road as fulltime RVers, I had already been obsessed with tiny houses for quite a while. And in the summer of 2015, our household went through a “purge” of possessions as we played The Minimalism Game for the month of August. Maybe it was about me hitting “the big 4-0”, but around that time something in me shifted. Something in me started craving simplicity like a highly addictive drug. I truly needed less stuff. Less complication. Less hustle and hassle and hurry. All of this to say: The ideas of simplicity and less are not new to me. They were not new to me when we made this decision to travel in an RV with our family for months on end. 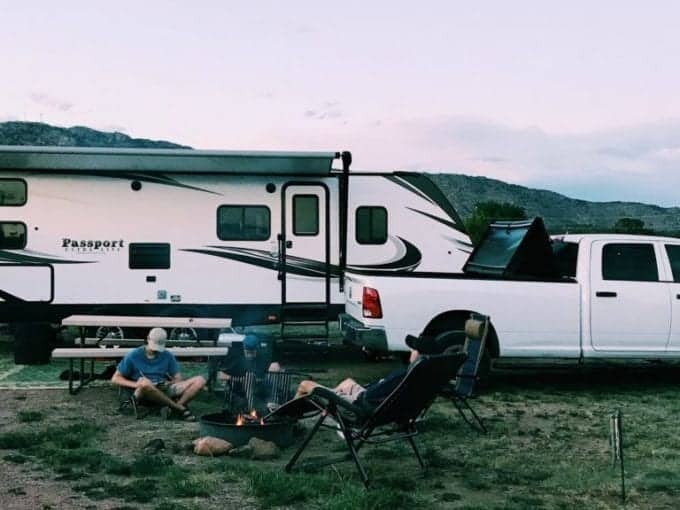 Did my desire for simplicity influence our decision about which RV and tow vehicle to buy? Yes, without a doubt. Did we get very intentional about only buying enough RV and vehicle to get this journey started? Yes. And did we know that we might be sacrificing some “creature comforts” in order to keep things simple on the road? Absolutely. We were aware of the trade offs, and we were okay with that. Is Any of This Ringing True With You? But maybe you’re not so sure about all of this simplicity stuff. Does this all sound completely foreign to you, like I’m from another planet or something? I get it. Believe me. But don’t check out on me just yet, because the RV decision is a very important one, especially if you will be transitioning into the fulltime RV life. So let’s talk through some of the thoughts running through your head, some of the fears you are staring down, as you move forward with this major decision. When we moved into our RV, it was five of us for the first few months. Five “full sized” people, since our kids were ages 13, 18, and 19 at the time. In a 26-foot travel trailer, that’s quite a bit of skin. I’ll admit it. But our oldest kiddo was only with us for the summer before heading back to college in northern Texas in August. So we were looking at figuring out the five person thing for about three months. With four people in the travel trailer, we felt like we could make it work pretty well since there were permanent beds for four people. Our daughter had to “take one for the team” and sleep on the converted dinette each night. But on top of these logistical issues, we also did wonder how much of a challenge it would be to “keep the peace” in an RV that size with that many people. After all, we had been in homes with at least 2,000 square feet for most of their lives…and the RV was around 200 square feet. Here’s the truth: We didn’t know for sure how it was all going to work out. We didn’t know how many challenges we would face or how many fights we would break up or how many tears we would shed. There was no way we could know any of that. What we did know was that our family was ready for some adventure. Everyone was on board with the adventure, so everyone also had to get on board with making peace under these new circumstances. Ha! Come on, we’re human. We have had our fair share of conflict and tears, fights and shouts and storm outs. But here’s the thing: We dealt with plenty of that same stuff when we lived in our 2,300 square foot house, and we would have had it in an RV that was twice the size and cost 3-5 times as much money. 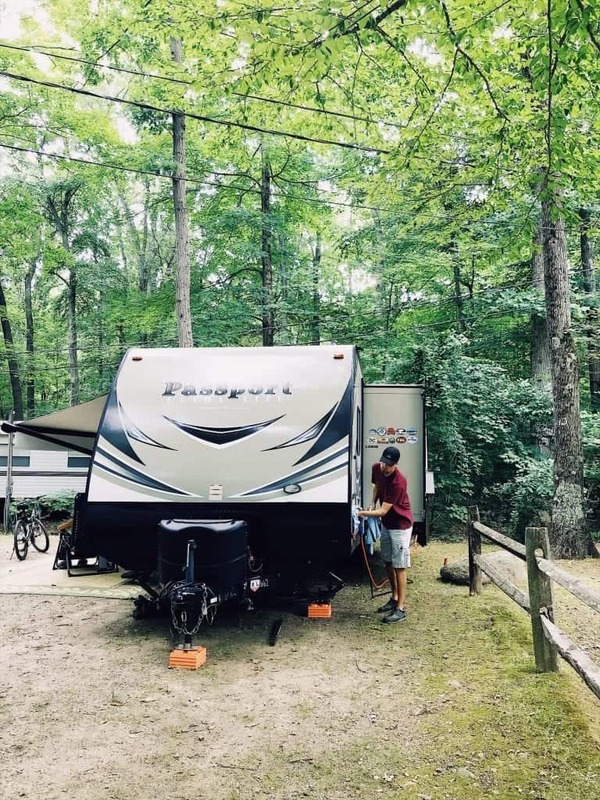 At the end of the day, we decided that we would make this RV work because the price made sense and it kept us away from a massive monthly payment. This fear of not being able to maintain a peaceful environment could easily have driven us to spend tens of thousands more dollars and put ourselves in a dangerous financial situation. But we stared that fear in the face and didn’t allow it to take control of the situation. “Well,” you say, “that’s all well and good unless you later decide you really have to have something bigger.” Ok, so let’s talk about that point. One of the things I think we all do, and the reason you are reading this, is to seek the perspectives and opinions of others who are further down this RVing road. Julie and I both absolutely did this when we were in research mode, both before and after making the decision to do this full time thing. And what I primarily saw online was that people were encouraging others to “go bigger now” instead of having to go through the hassle and expense later of selling and buying another vehicle. I actually saw this same tendency toward “go bigger” as it related to both RVs and tow vehicles. Not only were people telling me I needed a bigger RV with a “fudge factor” for comfort, but they also said that I should go with the 1-ton diesel truck instead of the 3/4 ton gas truck I ended up buying….just in case. 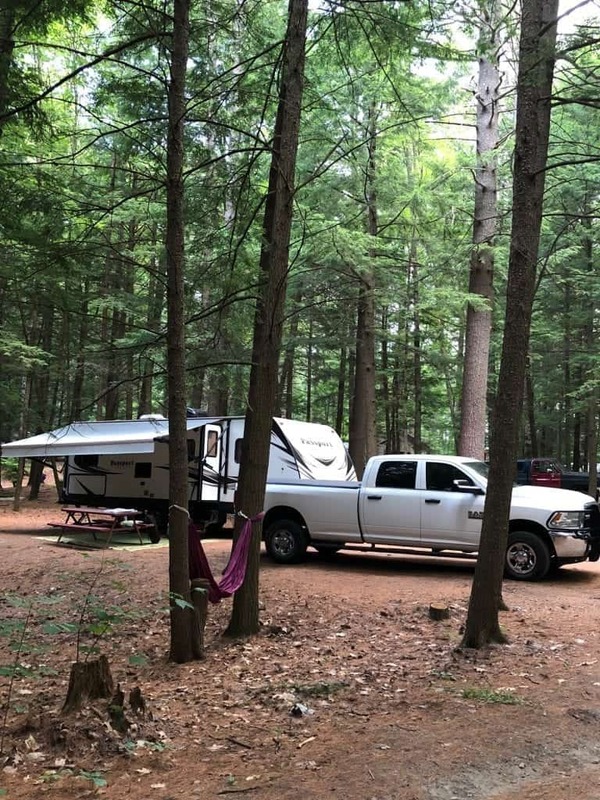 People had stories about all of the money they had lost in trading in both their RV and their tow vehicle when their new travel trailer or fifth wheel required the heftier tow vehicle in order to tow safely. Did I consider these viewpoints? Yes. Did they scare me a little bit and make me wonder if I could be making a mistake? Yes. 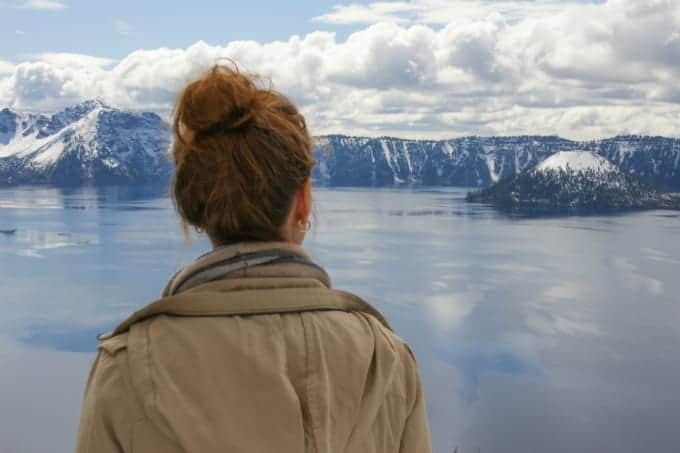 But when we really stopped and considered our current situation, our tendency toward simplicity, and our stage of life (two adult kids and the last one less than five years away from leaving the nest), we knew that we had to take those opinions with a grain of salt. We had to remember who WE were and not allow ourselves to get swept up in THEIR scary stories, in the fear that threatened to hijack our minds and decisions. So my bottom line advice to you is simply this: Remember that the folks giving out their free advice online (yes, this includes my own advice) don’t have a friggin’ clue about your personal situation, how you are wired or what direction your life is pointed. 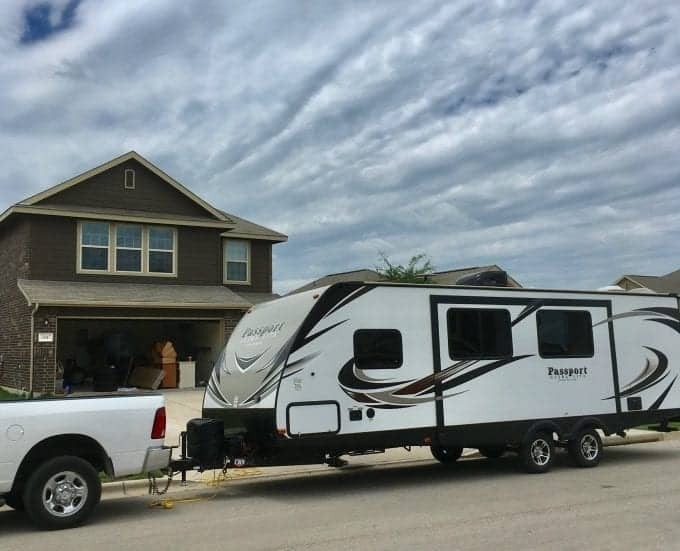 We felt extremely confident that this travel trailer was as big as we would ever choose to go. From here, we will downsize if we continue to RV. To thine own self (and situation) be true, my friend. This will lead you toward the wisest decision on this front. Fear #3 – How Will Other People Perceive My Choice of RV? Choosing the RV life does not mean you automatically escape from the dangerous pattern of “keeping up with the Joneses”. This is the one that will get you, my friend, even if the other fears do not. And here’s the deal: Odds are that the mental tapes which push you in that direction are playing on repeat in the background, completely unnoticed. That’s what makes them so dangerous. For me, shopping for an RV felt very similar to shopping for a house. In house shopping, you’re very conscious about ending up with the smallest or plainest house on the block and feeling like “less than” your neighbors. Or worse yet, ending up in completely the wrong neighborhood. No difference with RVs. All of the same fears are still dancing around in our pretty little heads, threatening to move us toward an unwise financial decision that is not truly our own. So here’s what I want to say to you: Buy YOUR RV for YOU and ONLY YOU. Forget about the possible perceptions of others. You are the one who will be traveling and/or living in it, and if you love it then there is nothing else to consider. 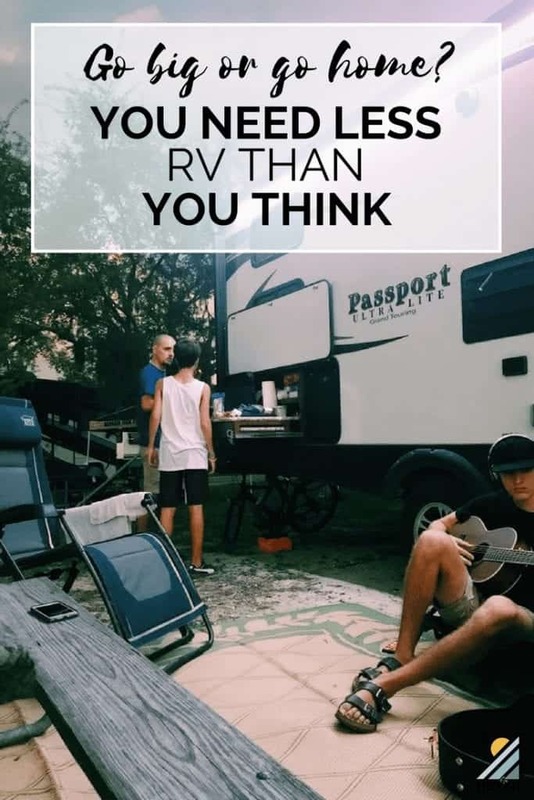 So Do You Need Less RV Than You Thought? Hey, maybe my musings have struck a chord with you and given you an epiphany, setting you free to make the absolute best decision about your RV. Maybe not. At the very least, I hope that I have helped to open your eyes a little bit wider and see just a touch more clearly as you navigate the challenging world of RVs and tow vehicles. I know the process is not easy, in fact it can be absolutely gut-wrenching. If these thoughts have helped you to at least take a confident step forward in the decision-making process, please let me know in the comments below. It would truly be great to hear from you. So, how has it helped you to consider these fears? All good advise! I believe it can be summed up with this. “Go with the smallest unit YOU can be “comfortable” in”. The answer for me was a 24 foot (box). I spent WAY more time looking into the way it was built than the floor plan. I am by myself most of the time but need a little extra space I can use when I am not. The 24 footer was perfect for me. Thanks for the feedback, Kevin! And yes, I think that’s a great way to sum it up. One selling point for us was the aluminum frame (instead of wood frame) on our rig, which kept the GVW down to 5,000 lbs. The other big selling point? Enclosed underbelly for “Four Season Camping”. We really tested that out last winter when we spent the month of December in Utah and Colorado…never again. 🙂 But what an adventure! Glad you found just the right rig for you as well. Thank you for the information. I am just starting this process of finding a “rv” fulltime for the first time. Very overwhelming, especially everyone else opinions. ugh…. Do have to ask why the never again in Colorado and Utah for the winter? I was hoping to spend some time in Colorado. I’m really glad to hear the info was helpful for you. It’s tough to write on a subject like this because every person and every situation is different. The different opinions can be overwhelming, and the best thing I can come back to as a foundation is: Don’t make the decision out of fear. So…Colorado and Utah. It was a beautiful but very stressful period for us. Let’s just say we were unprepared going into that leg of our journey and did not expect the very extreme temps that we encountered. I spent a lot of time figuring things out on the fly in that period, and learning some hard lessons. Lessons like: Make sure the outlet you plug your heated hose into is actually operational or it will cost you a brand new $100 heated hose. Or, make sure if you leave your rig at an RV park for a few days in extreme temps that you keep a small heat source near your water pump or it will freeze solid, blow apart and flood your bedroom. 🙂 You get the idea. Do your research ahead of time to be sure your RV is prepared for those extreme temps or it will cause money and stress issues. The other part of the cold temps is that we spent A LOT more time inside the RV together…and that can really put a strain on relationships. And sanity. When you can’t get out and about as much, especially individually, it really does take a toll. Hope that is helpful, Angela. Best of luck in your process and if you have any other questions, let me know! One thing to remember is that you shouldn’t get caught up on comparing your/kids space/privacy concerns with home.. kids will adapt to any small surroundings just to spend a fun camping trip anywhere!! We had more fun in our small RV because the kids were so on board with the adventure and not worried about the conveniences of privacy. Their best memories today as adults are the fun times we had together cramped in our little pop up tent trailer seeing some awesome parts of the country. They are now wanting to do the same with their kids. We intend to do the same with our Grandchildren now! But we have graduated from a pop up, into a little bigger trailer now!